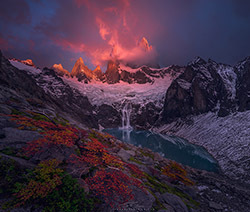 We are happy to present Ted Gore as our featured guest photographer this month. 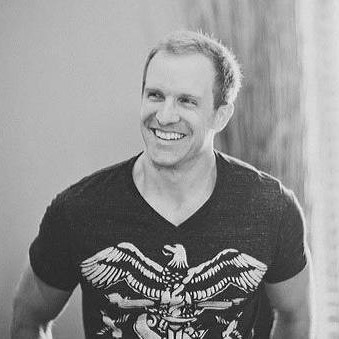 We appreciate his time and generosity in sharing his stunning photography with us! Please visit his links to see more of his work, and to let him know you enjoyed this interview. :: How did you get started in photography? How does your background in motion graphics help what you do with photography? My love for landscape photography has really been a confluence of my love for the outdoors, and creativity. My obsession for the outdoors started in college (where funny enough, I studied something entirely NOT creative, Chemical Engineering) when my roomates and I went backpacking on the Appalachian trail, which I then ended up hiking in its entirety in 2003. During my college years I also spent several summers doing internships in the bay area, and every spare moment I had, I was off in the Sierra Nevada backpacking as much as I could. I couldn’t get enough. I was into photography then, but not seriously, and my camera never made its way into the wilderness with me, it just wasn’t something I was interested in doing because I was VERY concerned with how much weight I carried with me. I liked traveling fast and light, so the camera always got the boot. As my career in the motion graphics industry started, I began to use photography more as a tool for that. My skills with the camera, and then with various software grew rapidly, and gave me a really great foundation for when I ultimately found my love for landscape photography. That blossomed from a vacation I took with family to Alaska. I began researching some techniques for shooting landscape and discovered this whole crazy world revolving around it. I haven’t been the same since. My career in motion graphics really gave me a boost with my abiities with landscape photography because when I picked it up, I already knew all of the software I needed for the processing side of things, and I was also knowledgable with graphic design and skills pertaining to composition and color, two very important aspects of graphic design. I found those translated over to landscape photography in a very helpful way. :: It seems that living in Los Angeles would be so hectic, and crazy. How did you end up there; were you from that area? How did you start getting out into nature more? I came to Los Angeles to pursue my career in motion graphic design with little concern for outdoor opportunities, as they had fallen by the wayside after college while I tried to navigate the waters of the creative industry. Long stressful hours are what it took to establish yourself in this industry. Being in Los Angeles actually put me in a much better scenario for picking that back up at a later date since where I was from, Georgia, really doesn't offer much in the way of landscape photography that I am interested in (more dramatic, mountainous terrain). Although lately, I’ve become interested in a fair amount of really interesting locations in the south east that I’d like to explore. But Los Angeles is actually pretty conveniently positioned for accessing many really fantastic outdoor areas. As I got more into landscape photography, I found myself taking the time and effort to access these places. :: Living in such a metropolitan area and being a landscape photographer must be tough. Where are your go-to areas for shooting locally, or do you shoot much locally? There isn't much happening locally around Los Angeles that is really interest on a world class level aside from a few prime coastal spots that I will go to for a quick fix occasionally. The consolation of living here is that I have pretty quick access to the Eastern Sierra, which offers a plethora of photography options and is only about 3.5 hours away. Also having a major airport right here, it’s pretty easy to hop on a plane and fly pretty much anywhere with relative ease/fewer connections. 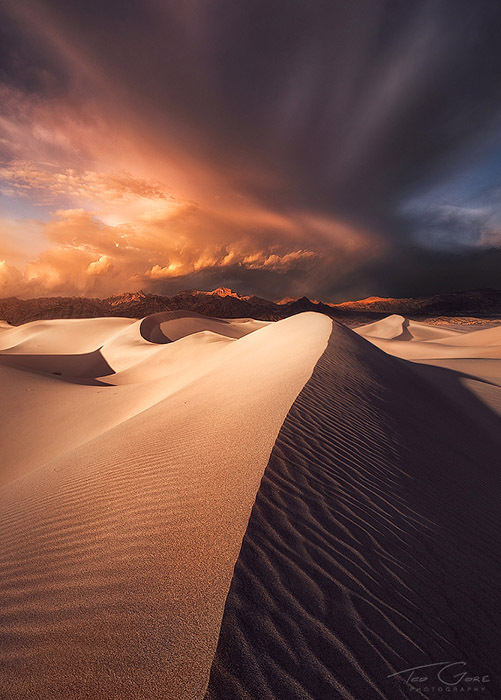 :: How did winning USA Landscape Photographer of the Year change things for you, or has it sunk in completely yet? Other than being featured in a few magazines, a flurry of emails and attention when it happened, and a little bit of extra cash in my pocket, it really didn’t change all that much. I’m definitely honored to have won it, especially considering the judge panel was made up of such talented and established individuals in our field. I think that’s what means most to me. To know that the work I’m doing made an impression on those people. Recognition is always great by anyone, but of course it’s extra special when it’s coming from the artists in your field that you admire most. Of course there was also the massive parties, cocaine binges, and endless women throwing themselves at me. It's been pretty nuts! Kidding! :: When it comes to processing and using what you’ve gotten in the field to create a final project, what kind of guidelines do you set for yourself? Everyone has their own ideas of what is too much or where to draw that line, I’m curious your thoughts and ideas when it comes to creating your artwork. I float around in some kind of grey middle ground when it comes to all of that. I certainly don’t let the camera define what it is I capture, I am not a documentary photographer. On the other end of the spectrum, I don’t care to misrepresent the grand forms of our natural world, so you’ll never see me put a lake in a place it wasn’t, grossly change the shape of some distinguishing natural object, or something a long those lines. Sometimes I may present an image with minimal processing, sometimes I do a lot, and the result may end up looking far from what I actually saw with my own eyes. I do see my image making as my personal art, and I treat it as such. I don’t personally have any interest in a documentary approach, and ultimately my images are a result of the equation, earth + me = my work. I am not one to throw around ‘rules’ for photography, and I don’t much care for it when others do that to me. There is just too much gray area, and everyone draws their own lines. I think people just need to keep those lines personal, and not try and force them on to others. The big debate with processing seems to be around the topic of disclosure. I am pretty open about how I approach my image making, but I am open about it in a more broad way rather then explaining exactly what I do with each image (other than what I show in my processing videos). I find doing this will ultimately pull the viewers attention away from what it is I am presenting to them, and will result in them focusing on the technical aspects of the image. I understand a lot of people are genuinely interested in that, so I do provide that information from time to time. :: When it comes to looking for a composition in the field, what draws you in to a spot? You’ve talked in other interviews about “Tunnel Vision.” How do you try to set up a shot so that maybe your finished version is different from what other's have done? Compositions are like puzzles to me. Utlimately what I gravitate towards is finding interesting ways to use the elements around me in a foreground, to present the subject in a way that glorifies it, immerses the viewer into the scene with the use of visual force, and also shows it’s relationship with it’s surroundings or the atmosphere. Visual force is a term used in graphic design(at least by the genius composition teacher I had) and simply using objects in different ways to lead the viewers eye through the scene and towards the subject. Most commonly you hear of leading lines, which is a form of visual force. I always try to approach a well photographed scene with fresh eyes and try to interpret in a way that is unique to me. This may be in composition, but sometimes it’s not. When that is the case and I’ve shot a composition similar to many others, I try and distinguish myself through capturing different, unique conditions and applying my own artistic take through processing. 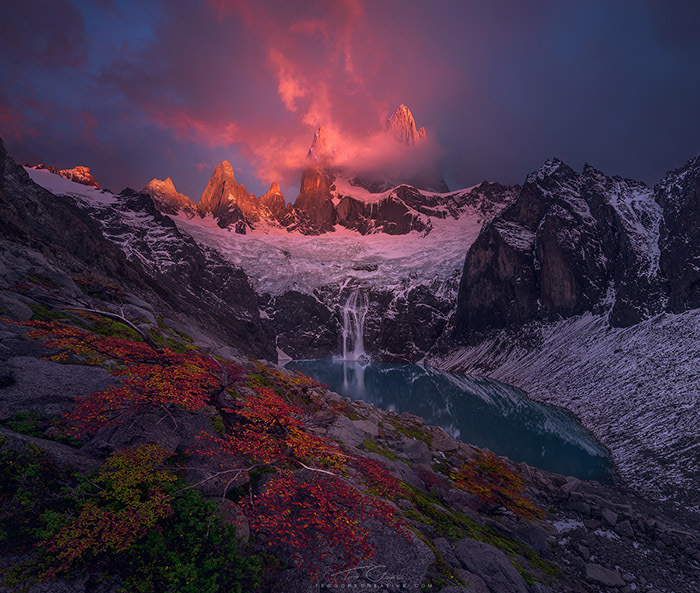 I was camped at the Lago Torre, which lies at the base of Cerro Torre, and one night after I had gotten in my tent and layed down to sleep I started hearing this really odd animal noise coming from the other side of the camp. It’s really hard to explain the sound, but it was somewhere between a parrot's squawk, a roaring dinosaur, and the bark of a sick dog, if you can imagine that! I wasn’t too aware of the wildlife in Patagonia other than some birds, Huemel (the local deer), and puma. As this certainly didn’t sound like a bird, or a deer, I began to wonder if I was hearing a puma searching around the campsite. Other than the vocal call it was making, everything was silent, and every time I heard it, it seemed to get closer to me. I was honestly more afraid than I’ve ever been in my life, and eventually this animal was right next to my tent. I was sweating, heart was racing… just didn’t know what to do. At one point I decided to try and scare it, and I shook my tent and screamed at it. This only seemed to provoke it/them, as shortly after I was surrounded by three of these creatures, all taking turns to scream at me. I’ve never shaken in fear like I did that night. I just decided to stay silent and still, and eventually they went away. The camp was pretty full, and the next morning we were all walking around talking to each other about it. Everyone was pretty freaked out, and everyone pretty much assumed it was puma. We even went hunting for tracks and actually found some small feline-like prints around my tent. I left later that day and returned to El Chalten where a friend of mine had a little cabin he was staying in for the year. When I got back I told him I had a run in with a puma, which he was ecstatic about… what a rare opportunity! Only, when I explained the noise it made, he just laughed at me and explained that it was actually the Huemel, the DEER, that was making that noise. Absolutely blew my mind. The tracks we found were actually just rabbit tracks. Absolutely frightening experience, but in hindsight, hilarious. I’ve searched for audio recordings of Huemel, but have not been able to find any. The closest thing I can find is a Roe Deer ‘barking.' Give it a YouTube search if you’d like to hear something similar to what I was hearing. :: You’ve mentioned some of the photographers you enjoy, and how their work or processing style has been influential to your own, but is there anything else you find motivation in or helps you be more creative? Knowing that there is an end result that brings me a lot of personal satisfaction. Being in a creative mindset can be really really frustrating and taxing for me, and can result in pushing me into some pretty low spots emotionally and mentally. It can also have the opposite effect and completely give me a sense of accomplishment, fulfillment and happiness when I capture an image and can develop in a way that I’m happy with and realizes my vision. Understanding that I can feel that way if I put the work in, motivates me to push through the lulls. I know many people who are artists, and take their art very seriously, and I notice this trend among many of them. It can make us extremely happy and it can also drive us, literally, into depression. I have to say that the smart phone has become an extremely valuable tool for so many reasons. Apps that tell me where the sun, moon, and the milky way will be help me pre visualize shots. GPS apps help me keep track of the locations of comps and/or subjects… in addition to myself when I’m out in the wilderness. Tides, moon phases, assistance with technical settings… you name it. We have it all in the palm of our hand now! It’s insane. :: You’ve mentioned one of your favorite parts of photography is the social aspect of the community…what is it about the landscape photography community that you find most endearing? There’s a flipside to that coin as well, what aspects maybe do you wish weren’t as present? 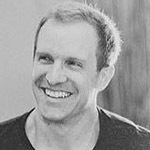 I have made several really great friends through the community, and I’ve since gone on to team up with some of them for workshops, such as Erin Babnik and TJ Thorne. Kindred spirits is an awesome thing, and I love pursuing my passion and venturing into the wilderness with these people. I’ve had some really amazingly fun trips and have been able to establish a pretty awesome network of people all over the world which gives me so many opportunities to travel more efficiently and more enjoyable because of the camaraderie. On that flipside… yeah, with landscape photography comes a lot of different views and opinions about what is ‘right’ or ‘wrong’, and I’ve seen and experience for myself plenty of times where crossing a person in the wrong way can result in a lot of drama and controversy. I’ve learned a lot about when and where is appropriate to offer criticism to others about their work and am guilty of getting caught up in the drama and controversy myself. I still slip up from time to time, but there have been some valuable lessons for me that I’ve had to learn the hard way. :: When someone who is aspiring to get into outdoor photography asks you for a few key pieces of advice to help them, what do you say? Find inspiration. Copy them (but give credit)! It helps you learn. Go on workshops. Check out different artists' processing styles. Get out. Go further. Not far enough… further. Get on the ground… what’s it look like from there? Put your camera in live view and hold it way up above you… how’s that perspective look? Composition, composition, composition. This is the big one of me and what I really try to drive home for people asking for my guidance. And learn your camera. Make your camera an extension of yourself so you can quickly make adjustments to take advantage of fleeting moments. It’s always frustrating for a client of mine to miss a shot because they aren’t fast enough technically with their gear. :: What’s on your list of projects for the next few months? What’s on the bigger bucket list? 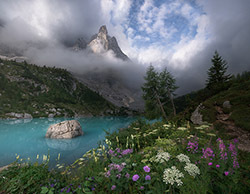 I am headed back to the Dolomites in August to run a workshop with Erin Babnik, after which I’ll be checking out Scotland and possibly Faroe Islands and Greenland. This world is too big with too many beautiful places, it makes it really hard to focus on what to do next. Some big targets for me are many places in China, the Himalayas, and the Cordillera Blanca in Peru. :: Are there any other things photographically that you shoot other than landscapes? If no, why not? I am very dedicated to landscape photography and honestly couldn’t be bothered with any other genre of photography. I enjoy viewing all kinds of photography, but I believe that in order to really master one discipline of photography, I need to commit to it fully. It’s hard enough in the time I have to accomplish what I do… I couldn’t imagine trying to pick up and master another genre of photography. :: Once you’d learned your gear and developed a processing style, what’s been the most difficult part of photography for you to work with, and how have you dealt with it? Probably the most difficult thing I have to deal with personally is creativity and inspiration. So often I find myself just feeling numb, uninspired, and somewhat paralyzed when it comes to producing content. What makes it worse that I know I NEED to produce content in order to keep things moving along because I do have a desire for this to somewhat of a career for me. It’s really difficult to be out on a shooting trip for a month, and be in that creative space of the field work, only to come home and sometimes launch myself immediately into doing motion graphics, and then try and find time and energy to harness a completely different form of creativity to get my images processed. As stated before in the answer for a previous question, it’s a very difficult scenario that can really leave me drained. Also with landscape photography in particular, another difficult thing other than gear and processing is traveling to locations, scouting said location, finding great compositions and then dealing with the sometimes extreme environments that I have to be in in order to get really interesting shots. Extreme temperatures, brutal winds, weather, hiking, backpacking... that kind of stuff is definitely far more difficult than learning gear or processing, but it’s the stuff that makes me feel alive, and the moments I remember. I love telling the stories behind those images, and people really get a kick out of hearing them. Those experiences are what keep me going back, but I just have to remember to keep myself safe. "Extreme temperatures, brutal winds, weather, hiking, backpacking... that kind of stuff is definitely far more difficult than learning gear or processing, but it’s the stuff that makes me feel alive, and the moments I remember."